If you and I were to grab a cup of coffee today and if I were to share my heart with you, this is what I’d say. I fight against it like a boxer in a ring. Some days I win, but many more days I lose. I pray weekly…who am I kidding, I pray daily against it. I hate that my struggle with discouragement is ongoing. It never seems to take a vacation. There are days when I count the cost and if I allow my heart to lead my mind…I wonder if all the struggles, if all the trials, if all the sacrifices are really worth it. And when I allow my heart to lead my mind down this well-worn road, I allow temptation to make me wonder the “what ifs.” What if I stopped serving? What if I stopped writing? What if I stopped leading and helping women get into God’s Word every day? Just think of how much easier my life would be. How much more time I’d have to do other things? How less stressed that I’d feel. There are days when I intentionally have to turn off the emotions I’m feeling and the doubts that flood my mind the moment I wake up and instead choose to move, choose to get out of bed, choose to work…regardless of how I’m feeling. Because this is the truth, this world is not my home and it’s not yours either. Life here is not perfect. We don’t always get the happily ever after or the happy endings…not this side of heaven at least. I don’t think I’m alone in my struggle with discouragement. I think Paul got discouraged from time to time, too. And that’s why I love reading, 2 Corinthians 4:8-9…in a strange way, it encourages me. Paul, a man seen as a hero in our faith was also a man who knew trails, pain and discouragement. Just like me, and I’m guessing…just like you, too. Paul’s life was far from perfect and not even close to being called “easy,” yet he pressed on. Even in the midst of the struggles and discouragement he put aside his emotions and followed hard after God. Looking at Paul’s ministry in light of the world’s definition of success, Paul was not very successful. And yet despite the discouragement, setbacks and struggles…he continued on. Like Paul, we can still choose to be brave when we are discouraged. For every reason we have to be discouraged, is also an opportunity to glorify God. It is hard for the world to see the difference Christ makes in our lives when our lives seem perfect and worry-free. Yet, when life knocks us down and we choose to be brave and get back up, those in our lives notice. 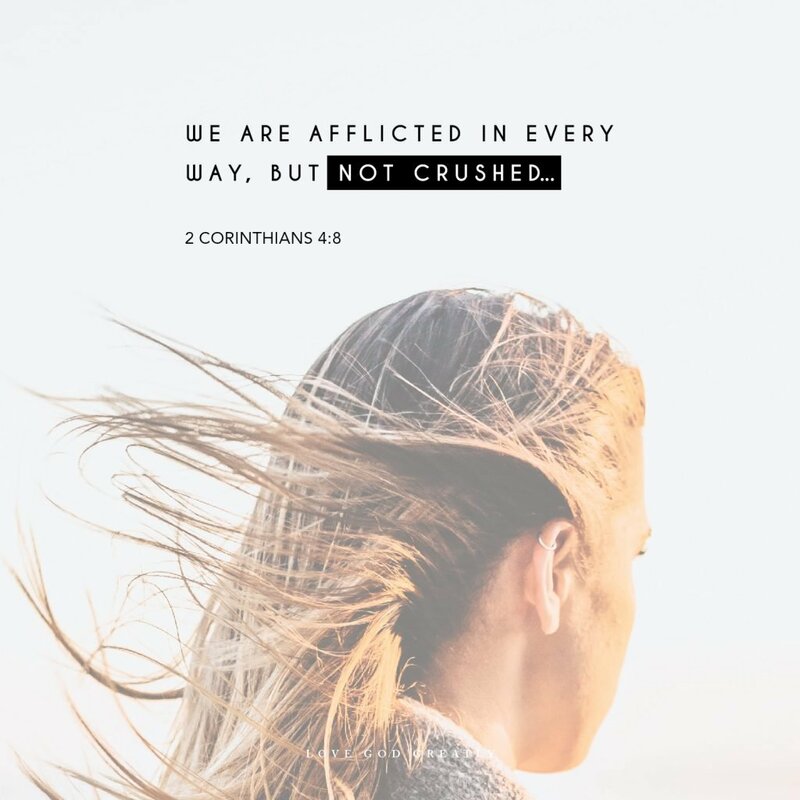 Like Paul, when we are hard pressed by life’s circumstances, yet not crushed…we are given the opportunity to display the difference Christ makes in our lives. Our struggles are real, but so is our Savior. Discouragement does not discriminate, but neither does God. He freely gives us His power and exactly what we need to be brave in the midst of our battles. My prayer for me and for you is that God will give us spiritual eye-sight, not just physical. Eyesight to see the world the way He sees it, so even though what we see may be discouraging, we know from Mark 10:27, that nothing is impossible for God. God is always working in the midst of our lives. Let’s choose to be brave in spite of the discouragement life throws our way and instead, choose to move forward in faith knowing God is with us each step of the way, regardless of how we feel. AMEN, Sweet sister. Speaking to my HEART today! Thankyou Angela for your honesty. I so appreciate the work that you are part of in LGG. Thankyou for the encouragement. I too was reminded this morning as I studied of the fact that these troubles are light and momentary. It does help to remember that. God is good though the world is not. Thanks so much Angela for all and your team do. Your ministry has blessed me in so many ways. It’s been a way for my best friend and I to stay connected even when oceans have separated us!!! And it’s helped me to grow tremendously in my faith. God is using you for sure!!! Amen! And thank you for everything you ladies do. I sit here in my dining room with this study by myself, not alone but my Lord is here. But I don’t have anyone to study with so I turn to your blog. And because of Jesus and the work you ladies do by day is brighter! I get to read that I am not alone!!! Thank you keep pressing on! God bless your all, your work and each lady involved in these studies! Thank you, Angela, for the ways your faithfulness to the Love God Greatly ministry has blessed my life for the last three years. You have helped me connect with others who help keep me accountable to the daily reading of God’s Word, you have inspired me with your passion to get these tools out to women around the world, and your honesty about your own struggles encourages me to be more patient and hopeful with myself. If I were sitting down with you for coffee today, that is what I would say! And that goes for each of the women who have a part in all God is doing through Love God Greatly. I have felt it on my heart lately to tell you this, and today God said, “Don’t wait any longer!” He is using you as a light in the darkness, and I am committed to praying for all of you as you continue to look to Him for His gentle leading each step of the way. I participate in several online Bible studies. I like LGG because it’s uncomplicated by tasks yet enlightening and easy to grab a few moments to record scripture and read the wonderful blogs. I really enjoyed the videos! Wow that was beautiful. Praise God. I love this app. I have read them all. And I truly see God speak to me through them all. You ladies are used by God to help is women all around the world. May God keep using you for His glory. And may He keep blessing and providing. I’m Jesus name. Amen.